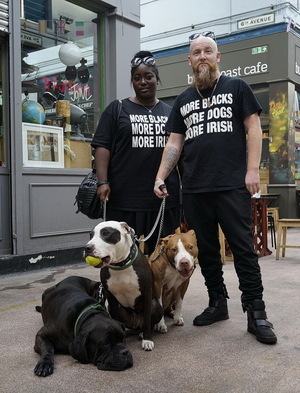 You can order a ‘More Blacks, More Dogs, More Irish’ tee by emailing Consciouspower@outlook.com. Posted in Misc and tagged More Blacks, More Dogs, More Irish at 2:32 pm on August 2, 2016 by Broadsheet. Not more dogs, especially those breeds. generally any ideas on how to ensure they only get to be with caring owners tho? It’s not the dogs that are the problem. It’s some of the numbnut owners. This is so unnecessary and attention seeking its sickening. We don’t need this nonsense in the world! It’s all silly attention-seeking, isn’t it? And someone else should slag them off for making a positive message, and it should be ME. – We don’t need this nonsense in the world! indeed. The only thing I do here is amuse MYSELF. I do my best to never hurt anyone and I steer clear of issues where I might. I do. It is obviously http://www.ugly.org/UGLY-MODELS/ photo shoot. Do they even have allow black people into Brixton anymore? If the pictures were of gay / disabled people or asylum seekers reminding us of the discrimination they face / faced, would the level of dismissiveness and ignorance be the same? Dim idiots and their human owners…. Jesus wept at length. I love to see happy people spreading a positive message of love and harmony. There is NOTHING positive about these shirts. ‘There is nothing positive’ about both your comments. “This is so unnecessary and attention seeking its sickening. So if the scale you personally use to analyse something’s worth to the world is how ‘positive’ it is, therefore on the basis of your own self-made scale, your comments have no value. Indeed, you have made a ‘nonsense’. 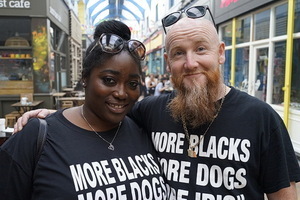 There’s everything positive about these shirts if you are black Irish or a dog. It just makes everyone else feel uncomfortable. When hate n bigotry stares us right in the face.